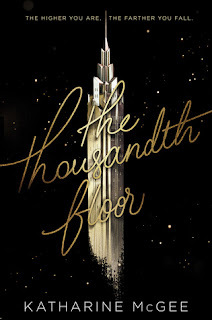 The Thousandth Floor was on my short list to read for quite some time. I finally picked it up and was a little disappointed. It reminded me of Gossip Girl, but in the future and with much brattier characters. There were several different POVs and I found myself constantly becoming irritated with the characters. There were good parts to the story, but not enough to make me really like it. I did like the futuristic feel to everything, but the high importance of money and wealth really wore me down. The characters weren't relatable and most of them were pretty terrible people. I constantly found myself just shaking my head and saying, "why... why would you do/say that? That's just horrible". I find it difficulty to read books with lots of gossip, drama, and teenage emotions, and this book just had way to much of all three of those things. I know there are a lot of people who really enjoyed this book, so I don't want to completely write it off. There are rumors of a sequel, and I would be interested to see how that turns out. I'm not great at starting a book/series without finishing it, so I'll try to check out book two when it is published, just in case the story takes a turn for the better. I would recommend this to people who really enjoyed Gossip Girl and Pretty Little Liars. I didn't particularly love The Thousandth Floor, but don't let me talk you out of it!